President Donald Trump has been briefed on Friday’s massive 7.0 earthquake in Alaska. Trump has been holding meetings with world leaders at the Argentina G20 summit. The quake measured a 7.0 magnitude after being updated from an early 6.6 magnitude measure. 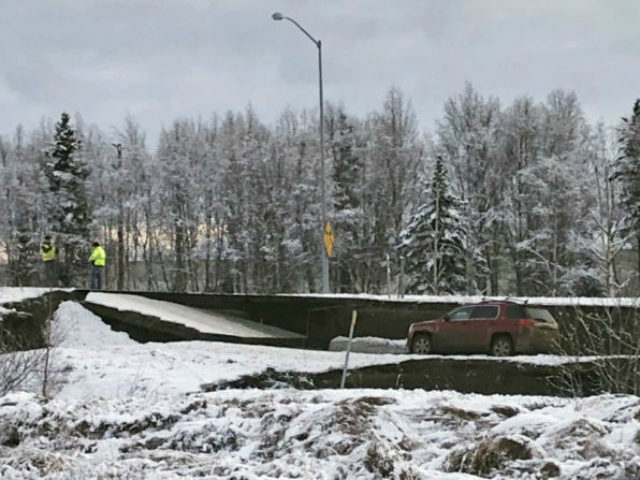 The 19-mile-deep quake hit just north of Anchorage in Point MacKenzie. Photos and video of destroyed roads and massive internal building damage began streaming onto the Internet shortly after the quake, showing trashed rooms. One video shows a courtroom as the quake begins, along with the jarring, prolonged shaking that sent people ducking under desks. The National Tsunami Warning Center issued a tsunami warning that was later lifted in southern coastal regions of Alaska.